Hakusan, Japan, September 6, 2018 – EIZO Corporation (TSE: 6737) announced that it has received FDA 510(k) clearance for breast tomosynthesis, mammography, and general radiology from the U.S. Food and Drug Administration for its 5 megapixel monochrome medical monitor, the RadiForce GX560. The GX560 utilizes a low temperature polysilicon (LTPS) liquid crystal display, which can reach a maximum brightness of 2500 cd/m2. This ensures that when calibrated to 1000 cd/m2, EIZO can guarantee 5 years of use. Furthermore, it has a high contrast ratio of 1700:1, displaying deep blacks without any washout. This makes it suitable for faithfully reproducing images for mammography and breast tomosynthesis. 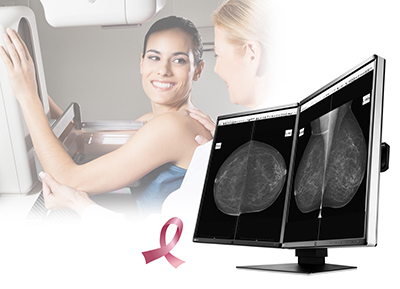 For breast imaging, it is common to view images side-by-side on two monitors in order to see all images at once. The GX560 is available as either a single monitor, or as a combined dual monitor set called RadiForce GX560 MammoDuo to accommodate multi-monitor use. The GX560 MammoDuo includes a unique dual stand that holds both monitors at once. Furthermore, the stand is designed so that the height, tilt, and swivel of the two monitors can be adjusted without creating any gaps between them. When using the GX560 MammoDuo, the combined bezel width is only 15 mm (7.5 mm on each monitor). Additionally, the bezel sits only 2.5 mm above the screen, making it almost completely flush with the screen. All of this helps to reduce distractions when working between the two screens. With these features the RadiForce GX560 has received FDA 510(k) clearance in tomosynthesis, mammography, and general radiography, making it ideal for all breast imaging types. In this way EIZO continues to provide a high degree of customer assurance to medical breast screening professionals and their patients. EIZO will demonstrate the RadiForce GX560 in Booth 6328 in North Hall B at the 104th Radiological Society of North America (RSNA 2018) from November 25 to 29 at McCormick Place in Chicago, Illinois (USA).